Proteins are compounds composed of carbon, hydrogen, oxygen , and nitrogen , which are arranged as strands of amino acids . They play an essential role in the cellular maintenance, growth, and functioning of the human body. Serving as the basic structural molecule of all the tissues in the body, protein makes up nearly 17 percent of the total body weight. To understand protein's role and function in the human body, it is important to understand its basic structure and composition. Amino acids are the fundamental building blocks of protein. Long chains of amino acids, called polypeptides, make up the multicomponent, large complexes of protein. The arrangement of amino acids along the chain determines the structure and chemical properties of the protein. Amino acids consist of the following elements: carbon, hydrogen, oxygen, nitrogen, and, sometimes, sulfur. The general structure of amino acids consists of a carbon center and its four substituents, which consists of an amino group (NH 2 ), an organic acid (carboxyl) group (COOH), a hydrogen atom (H), and a fourth group, referred to as the R-group, that determines the structural identity and chemical properties of the amino acid. The first three groups are common to all amino acids. The basic amino acid structure is R-CH(NH2)-COOH. There are twenty different forms of amino acids that the human body utilizes. These forms are distinguished by the fourth variable substituent, the R-group, which can be a chain of different lengths or a carbon-ring structure. For example, if hydrogen represents the R-group, the amino acid is known as glycine, a polar but uncharged amino acid, while methyl (CH 3 ) group is known as alanine, a nonpolar amino acid. Thus, the chemical components of the R-group essentially determine the identity, structure, and function of the amino acid. The structural and chemical relatedness of the R-groups allows classification of the twenty amino acids into chemical groups. Amino acids can be classified according to optical activity (the ability to polarize light), acidity and basicity, polarity and nonpolarity, or hydrophilicity (water-loving) and hydrophobicity (water-fearing). 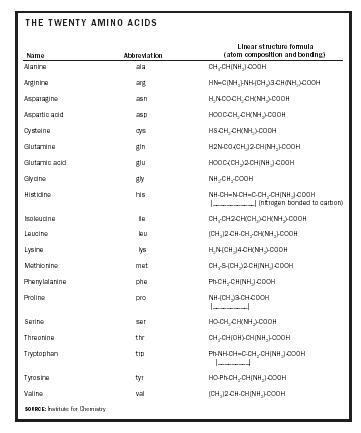 These categories offer clues to the function and reactivity of the amino acids in proteins. The biochemical properties of amino acids determine the role and function of protein in the human body. consist of a sufficient and balanced supply of both essential and nonessential amino acids in order to ensure high levels of protein production. The quality of protein depends on the level at which it provides the nutritional amounts of essential amino acids needed for overall body health, maintenance, and growth. Animal proteins, such as eggs, cheese, milk, meat, and fish, are considered high-quality, or complete, proteins because they provide sufficient amounts of the essential amino acids. Plant proteins, such as grain, corn, nuts, vegetables and fruits, are lower-quality, or incomplete, proteins because many plant proteins lack one or more of the essential amino acids, or because they lack a proper balance of amino acids. Incomplete proteins can, however, be combined to provide all the essential amino acids, though combinations of incomplete proteins must be consumed at the same time, or within a short period of time (within four hours), to obtain the maximum nutritive value from the amino acids. Such combination diets generally yield a high-quality protein meal, providing sufficient amounts and proper balance of the essential amino acids needed by the body to function. Protein digestion begins when the food reaches the stomach and stimulates the release of hydrochloric acid (HCl) by the parietal cells located in the gastric mucosa of the GI ( gastrointestinal ) tract. Hydrochloric acid provides for a very acidic environment , which helps the protein digestion process in two ways: (1) through an acid-catalyzed hydrolysis reaction of breaking peptide bonds (the chemical process of breaking peptide bonds is referred to as a hydrolysis reaction because water is used to break the bonds); and (2) through conversion of the gastric enzyme pepsinogen (an inactive precursor) to pepsin (the active form). Pepsinogen is stored and secreted by the "chief cells" that line the stomach wall. Once converted into the active form, pepsin attacks the peptide bonds that link amino acids together, breaking the long polypeptide chain into shorter segments of amino acids known as dipeptides and tripeptides. These protein fragments are then further broken down in the duodenum of the small intestines . The brush border enzymes, which work on the surface of epithelial cells of the small intestines, hydrolyze the protein fragments into amino acids. The cells of the small intestine actively absorb the amino acids through a process that requires energy . The amino acids travel through the hepatic portal vein to the liver, where the nutrients are processed into glucose or fat (or released into the bloodstream). The tissues in the body take up the amino acids rapidly for glucose production, growth and maintenance, and other vital cellular functioning. For the most part, the body does not store protein, as the metabolism of amino acids occurs within a few hours. Amino acids are metabolized in the liver into useful forms that are used as building blocks of protein in tissues. The body may utilize the amino acids for either anabolic or catabolic reactions. Anabolism refers to the chemical process through which digested and absorbed products are used to effectively build or repair bodily tissues, or to restore vital substances broken down through metabolism. Catabolism , on the other hand, is the process that results in the release of energy through the breakdown of nutrients, stored materials, and cellular substances. Anabolic and catabolic reactions work hand-in-hand, and the energy produced in catabolic processes is used to fuel essential anabolic processes. The vital biochemical reaction of glycolysis (in which glucose is oxidized to produce carbon dioxide, water, and cellular energy) in the form of adenosine triphosphate, or ATP, is a prime example of a catabolic reaction. The energy released, as ATP, from such a reaction is used to fuel important anabolic processes, such as protein synthesis. The metabolism of amino acids can be understood from the dynamic catabolic and anabolic processes. In the process referred to as deamination , the nitrogen-containing amino group (NH 2 ) is cleaved from the amino acid unit. In this reaction, which requires vitamin B6 as a cofactor, the amino group is transferred to an acceptor keto-acid , which can form a new amino acid. Through this process, the body is able to make the nonessential amino acids not provided by one's diet. The keto-acid intermediate can also be used to synthesize glucose to ultimately yield energy for the body, and the cleaved nitrogen-containing group is transformed into urea, a waste product, and excreted as urine. Proteins are vital to basic cellular and body functions, including cellular regeneration and repair, tissue maintenance and regulation, hormone and enzyme production, fluid balance, and the provision of energy. Protein is an essential component for every type of cell in the body, including muscles, bones, organs, tendons, and ligaments. Protein is also needed in the formation of enzymes, antibodies , hormones, blood-clotting factors, and blood-transport proteins. The body is constantly undergoing renewal and repair of tissues. The amount of protein needed to build new tissue or maintain structure and function depends on the rate of renewal or the stage of growth and development . For example, the intestinal tract is renewed every couple of days, whereas blood cells have a life span of 60 to 120 days. Furthermore, an infant will utilize as much as one-third of the dietary protein for the purpose of building new connective and muscle tissues. Amino acids are the basic components of hormones, which are essential chemical signaling messengers of the body. Hormones are secreted into the bloodstream by endocrine glands, such as the thyroid gland, adrenal glands, pancreas, and other ductless glands, and regulate bodily functions and processes. For example, the hormone insulin , secreted by the pancreas, works to lower the blood glucose level after meals. Insulin is made up of forty-eight amino acids. Enzymes, which play an essential kinetic role in biological reactions, are composed of large protein molecules . Enzymes facilitate the rate of reactions by acting as catalysts and lowering the activation energy barrier between the reactants and the products of the reactions. All chemical reactions that occur during the digestion of food and the metabolic processes in tissues require enzymes. Therefore, enzymes are vital to the overall function of the body, and thereby indicate the fundamental and significant role of proteins. The presence of blood protein molecules, such as albumins and globulins, are critical factors in maintaining the proper fluid balance between cells and extracellular space. Proteins are present in the capillary beds, which are one-cell-thick vessels that connect the arterial and venous beds, and they cannot flow outside the capillary beds into the tissue because of their large size. Blood fluid is pulled into the capillary beds from the tissue through the mechanics of oncotic pressure, in which the pressure exerted by the protein molecules counteracts the blood pressure . Therefore, blood proteins are essential in maintaining and regulating fluid balance between the blood and tissue. The lack of blood proteins results in clinical edema , or tissue swelling, because there is insufficient pressure to pull fluid back into the blood from the tissues. The condition of edema is serious and can lead to many medical problems. not necessarily economical for the body, because tissue maintenance, growth, and repair are compromised to meet energy needs. If taken in excess, protein can be converted into body fat. Protein yields as much usable energy as carbohydrates, which is 4 kcal/gm (kilocalories per gram). Although not the main source of usable energy, protein provides the essential amino acids that are needed for adenine, the nitrogenous base of ATP, as well as other nitrogenous substances, such as creatine phosphate (nitrogen is an essential element for important compounds in the body). The recommended protein intake for an average adult is generally based on body size: 0.8 grams per kilogram of body weight is the generally recommended daily intake. The recommended daily allowances of protein do not vary in times of strenuous activities or exercise, or with progressing age. However, there is a wide range of protein intake which people can consume according to their period of development. For example, the recommended allowance for an infant up to six months of age, who is undergoing a period of rapid tissue growth, is 2.2 grams per kilogram. For children ages seven through ten, the recommended daily allowance is around 36 total grams, depending on body weight. Pregnant women need to consume an additional 30 grams of protein above the average adult intake for the nourishment of the developing fetus. 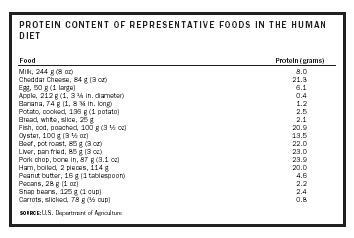 Good sources of protein include high-quality protein foods, such as meat, poultry, fish, milk, egg, and cheese, as well as prevalent low-quality protein foods, such as legumes (e.g., navy beans, pinto beans, chick peas, soybeans, split peas), which are high in protein. The nitrogen balance index (NBI) is used to evaluate the amount of protein used by the body in comparison with the amount of protein supplied from daily food intake. The body is in the state of nitrogen (or protein) equilibrium when the intake and usage of protein is equal. The body has a positive nitrogen balance when the intake of protein is greater than that expended by the body. In this case, the body can build and develop new tissue. Since the body does not store protein, the overconsumption of protein can result in the excess amount to be converted into fat and stored as adipose tissue . The body has a negative nitrogen balance when the intake of protein is less than that expended by the body. In this case, protein intake is less than required, and the body cannot maintain or build new tissues. A negative nitrogen balance represents a state of protein deficiency, in which the body is breaking down tissues faster than they are being replaced. The ingestion of insufficient amounts of protein, or food with poor protein quality, can result in serious medical conditions in which an individual's overall health is compromised. The immune system is severely affected; the amount of blood plasma decreases, leading to medical conditions such as anemia or edema; and the body becomes vulnerable to infectious diseases and other serious conditions. Protein malnutrition in infants is called kwashiorkor , and it poses a major health problem in developing countries, such as Africa, Central and South America, and certain parts of Asia. An infant with kwashiorkor suffers from poor muscle and tissue development, loss of appetite, mottled skin, patchy hair, diarrhea, edema, and, eventually, death (similar symptoms are present in adults with protein deficiency). Treatment or prevention of this condition lies in adequate consumption of protein-rich foods. SEE ALSO Amino Acids . Berdanier, Carolyn D. (1998). CRC Desk Reference for Nutrition. Boca Raton, FL: CRC Press. Briggs, George M., and Calloway, Doris Howes (1979). Bogert's Nutrition and Physical Fitness, 10th edition. Philadelphia, PA: W. B. Saunders. Johnston, T. K. (1999). "Nutritional Implications of Vegetarian Diets." In Modern Nutrition in Health and Disease, 9th edition. M. E. Shills, et al, eds. Baltimore, MD: Williams & Wilkins. Robinson, Corrinne H. (1975). Basic Nutrition and Diet Therapy. New York: Macmillan. U.S. Department of Agriculture (1986). Composition of Foods. (USDA Handbooks 8–15.) Washington, DC: U.S. Government Printing Office. Wardlaw, Gordon M., and Kesse, Margaret (2002). Perspectives in Nutrition, 5th edition. Boston: McGraw-Hill.